The U.S. military has been quietly working on a new long-range air-to-air missile since at least 2016, budget documents reveal. Users of the online Secret Projects forum first noticed the LREW line item buried deep inside nearly thousand-page budget. The new munition’s emergence after at least two years of development helps to explain the apparent inaction on a longstanding gap in U.S. military capabilities. Russia and China are both developing air-to-air missiles with range in excess of 100 miles. The United States, by contrast, still relies on versions of the 1980s-vintage AIM-120 that reportedly can fly around 90 miles, at best. The U.S. Navy’s F-14s carried very-long-range AIM-54 missiles, but those fighters and their special weapons retired in the early 2000s. 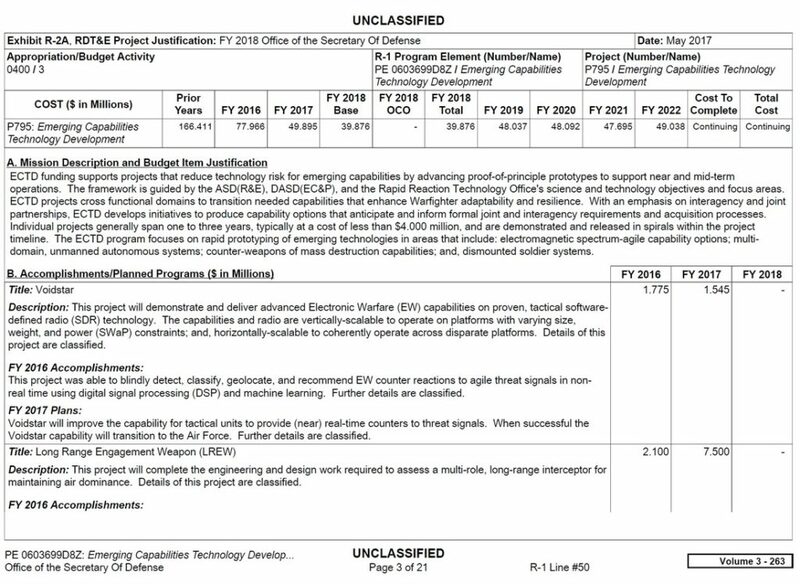 The military didn’t request any money for LREW for 2018. A modular, long-range weapon would fit within the U.S. military’s emerging concept for aerial warfare. The Air Force has developed tactics for combined formations of F-22s and F-15s, where a few stealthy F-22s fly ahead and designate targets for larger numbers of non-stealthy F-15s hauling heavy missile-loads. Likewise, the Pentagon’s Strategic Capabilities Office is working on an “arsenal plane” that could fly behind a screen of stealth fighters and lob missiles at long range. Officials have mentioned B-1 and B-52 bombers as possible arsenal-plane candidates. With their large payloads, a handful of bombers could bring potentially hundreds of LREWs to an aerial battle. It’s unclear whether — and how fast — industry might take up the LREW concept and begin to actually build missiles. China reported conducted the first test-launch of its own new, long-range air-to-air missile in late 2016.